Festival Pass including entry to all Submerge events other than "The Cube" (Ticketed Separately). Festival Pass including entry to all Submerge events other than "The Cube" (Ticketed Separately). 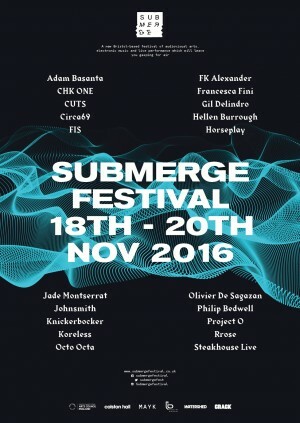 This ticket includes a £25 donation to Submerge, helping us continue the festival into it's second edition. DIVE / Friday 18th November / Colston Hall / 7.00pm – 9.00pm / Soulful electronics, laser light and mylar mirrors combine to hypnotic effect in an audiovisual concert which blurs the lines between sound, light and visual art. Into The Deep / Friday 18th November / Loco Klub / 9.00pm – 1.00am / Descend into deeper waters with durational performance, live electronic music and a site-responsive audiovisual installation marked by twelve points of light and sound. Ghosts / Saturday 19th November / St Thomas The Martyr Church / 3.00pm - 6.00pm / £13.50 / Dark, body-based performance, visceral live sculpture and intense vibrational sound await you in the beautiful surrounds of an 18th century church. The Lost City / Saturday 19th November / Coroners Court / 7.00pm – 9.00pm / A violent act of destruction gives way to live cinematic sound. Experience total bodily immersion into an all enveloping audio, performed in total darkness. The Ascent / Saturday 19th November / Coroners Court / 11pm – Late / Enter a higher state at the festival club with woozy late-night house, techno and surreal performance at a former mortuary and court. A new Bristol-based festival of audiovisual arts, electronic music and live performance which will leave you gasping for air. NB: Some Submerge Festival venues are not wheelchair accessible. Please contact us to discuss your access needs.